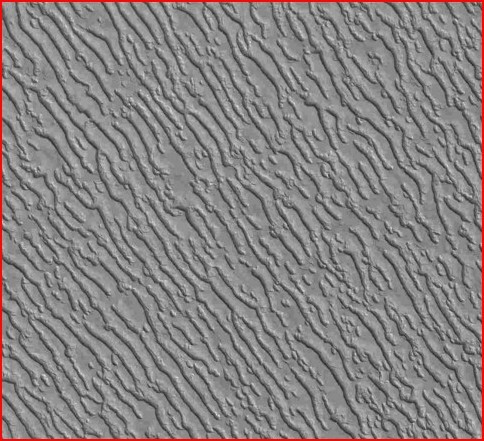 The trenches in the dry ice around Mars’ south pole display many of the characteristics of electrical discharge machining. These parallel trenches have been cut into the carbon dioxide ice at Mars’ south pole. They illustrate typical characteristics of electrical discharge machining (EDM) by multiple arcs. Because each discharge channel is circular in cross section and strikes the surface at a right angle, it cuts a circular hole. Because the current is constant over this cross section, the bottom of the hole is flat. As the arc moves across the surface, it cuts a trench with constant width and depth and with circular ends, much like a router bit. The total current in natural discharges will vary, often suddenly, causing the discharge to cut deeper or shallower, wider or narrower, to branch, to jump, or to quench and re-strike some distance away. All these variations can be seen in the trenches imaged here. Many trenches have narrower and deeper trenches inside them or they have terraced walls, where a wider channel cut part way and then suddenly narrowed before cutting further. In the trenches and on the flat surfaces between them are circular depressions where a transient surge in power or a secondary spark eroded a bit of material without moving along the surface, creating a shallow crater. In several places the trenches are made up of a chain of overlapping craters. The trenches begin and end abruptly, often continuing in line with a previous trench. The cutting arc either jumped over the intervening space, or the arc quenched and re-struck some distance away as the electric field continued to move along the surface. Where an arc branched into two, or where two arcs coalesced into one, the axes of the trenches tend to join at a right angle, again a feature typical of electrical discharges. Repulsive forces tend to space simultaneous arcs equidistantly from each other, causing the trenches they cut to be roughly equally spaced. This region was probably cut by one or more “fans" of arcs, roughly in a plane, perpendicular to the surface, sweeping over the surface. The vertical forces in the accompanying electric field would have pulled the debris away from the surface into the atmosphere or into space. Alternatively, the heating of the debris (dry ice) by the electric current could have caused it to sublimate. In either case, the surface would be left free of debris, the trenches and craters left “rimless”, as is seen.